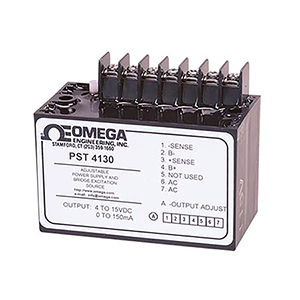 The PST-4130 is an ac line powered adjustable output power source designed for strain gages, load cells and pressure transducers. It can also be used as a high quality voltage source or reference in many applications. The PST-4130 has a split bobbin transformer for high line isolation. It also has remote sensing to eliminate line drop errors, and features excellent regulation, stability, and very low noise. Output Current: 150 mA max.